1. Soak beans over night in cold water. Place then in broiling salted water and cook until tender. 2. Cut the green beans on the bias and blanch them in boiling salted water for three minutes. 3. Trim and cut the fennel into a small dice. Heat olive oil in a large cassoulet add the fennel, carrots and zucchini and sweat covered on medium low heat until nearly tender (approx. five to eight mintes). Add (6) cloves of the sliced garlic and sauté for one additional minute. 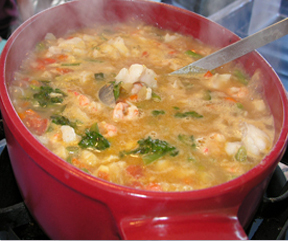 Add the seafood stock, bring the soup to a simmer and cook it out for three minutes. 4. Add the pasta and cook it at a simmer for an additional five minutes. 5. Add the cooked cannelini beans, chopped tomatoes and green beans. Bring the soup back to a simmer and them remove it from the heat. 6. Remove the stems for the basil and blanch the leaves in boiling water for thirty seconds then strain and shock the basil in cold water. Squeeze the basil leaves dry and chop fine. Mince the remaining garlic cloves and add them to the chopped basil. Whisk in the olive oil and season lightly with salt and pepper. 7. Heat oil in a large skillet. Add the sea scallops and shrimp and sauté until fully cooked about three minutes. Reheat the olive oil and sear the fresh haddock pieces on both sides. 8. Stir the pesto sauce into the soup and then ladle the soup into the serving bowls. 9. Top each serving with one shrimp, one scallop and a portion of seared haddock. Top with grate cheese and serve at once!